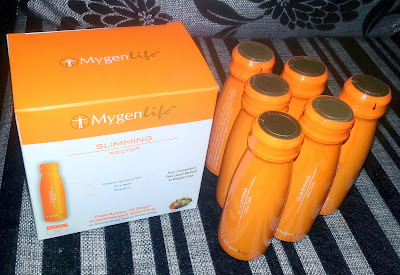 I received a pack of Slimming Drinks from Sample Store (https://www.samplestore.com/site/home) for a review. The Slimming Nectar is a powerful formula of enzymes supercharged with Chestnut Astringent Skin extract and Chia Seed provides safest nature's power for weight loss for life. Chestnut Astringent Skin extract- Supports reduction of carbohydrates absorption into the body. Chia Seeds- Great source of Omega3 fats and fibre. Helps to boost energy, stabilize sugar level and aids in digestion. Also contains amino acids, which helps to regulate appetite. Fibersol-2- Natural dietary fiber made from corn. The drink unlike other slimming drinks has a sweet and slightly tangy flavour, which is always welcome. Another things that I liked about the drink is that you can consume it any time of the day and so you need not bother about timings and having it before or after a meal as with most such drinks. Only one bottle a day is also a fair dosage. You can actually taste Chia Seeds as soon as you sip, if you shake the drink well. 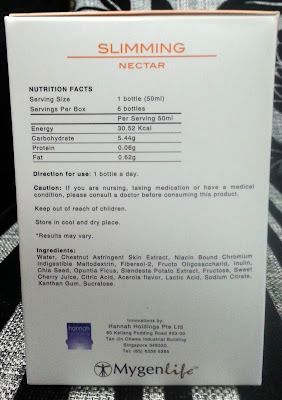 After taking a dose, I could actually feel less hungry than usual, which looks like a good sign and would love to try this for atleast 28 days as mentioned on the product. It is also a good source of fibre, which also helps to increase the satiety level and hence curb the appetite. 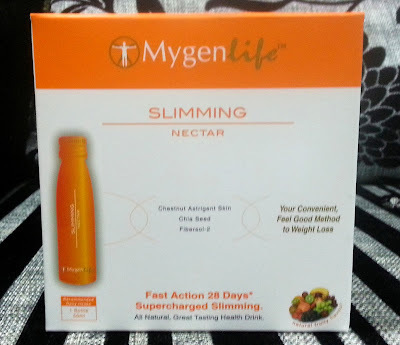 Mygen Life definitely seems like a promising product and is on my shopping list as well. If you would like to buy, you may do so at Guardian stores or Hannah Holding Website (http://www.hannah.com.sg/brands?page=shop.product_details&flypage=flypage.tpl&product_id=87&category_id=3) at S$49.90 for a pack of 6 bottles. You may also like to visit Love Yourself and Style Diva for links to related posts!